Between Christmas and New Year's Day the newly arrived contingent of 22 Thanhouser players and other employees enjoyed the scenic attractions of the Los Angeles area, arranged housing, and familiarized themselves with the new studio at 651 Fairview Place. During the next few weeks, additional personnel would come from the East. Carl Louis Gregory was in general charge of the settling in, as he had arranged the studio lease earlier and was familiar with the Los Angeles area from his travels there years before when he had his own photographic business. Gregory was to be a jack of all trades in coming months, managing the studio, assisting with the direction of certain films, and helping with photography. Los Angeles: Two of the Thanhouser Company's famous directors have arrived at the studio which the company has just opened in this city and are now at work. One is Francis Powell and the other L.J. Henderson. That the Thanhouser Company is now located here permanently is indicated by the fact that preparations are being made to equip the studio with a complete dark room plant, including facilities for making large numbers of positive prints. Within two months, it is announced, the studio will be equipped to manufacture all its own releases. Henderson is now making pictures under the Thanhouser brand, but Powell has begun work on a series that will be released under a new name not yet announced. There are still companies at work in New Rochelle, but it is expected that it is only a question of time before the headquarters will be transferred to the Pacific Coast. It is announced that a new brand of pictures to be called the Royal will shortly appear in the program of the Mutual Film Corporation. The makers of this brand are present under cover, and the first announcement is given in their advertisement in this issue of The Moving Picture World. The Royal pictures will remain at this new studio, Fairview Place, Los Angeles. It was planned that Royal films would be a separate entry on the Mutual Program and not identified in any way with Thanhouser, although Charles J. Hite pledged the Thanhouser studio's best efforts in launching the trademark. 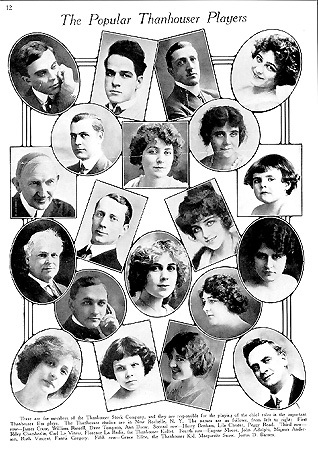 The Mutual Program was seeking to build up strength, and the Royal films were to join the split-reel Punch comedies which had made their debut the preceding December 5th. No one could have foreseen in early January, when Royal was being formed and initial scenarios were being prepared, that due to events in New Rochelle 2,500 miles away the new brand was not to be. Within a month Powell was to leave for employment elsewhere. On Thursday, January 2nd, Charles J. Hite dispatched another crew westward. The Middle Western Company, as it was known, departed by rail, with the first stop scheduled to be Chicago. Thomas N. Heffron, an old vaudeville man who had achieved great success despite the loss of a leg, was the director for the company, William Zollinger manned the camera, and the players included Harry and Ethyle Cooke Benham, their young son Leland, Mignon Anderson, and Frank Urson. Remaining home in New Rochelle were director Lawrence Marston, who was enjoying the success gained by the enthusiastic reception of theatre owners to his The Star of Bethlehem, Marguerite Snow and James Cruze, who were engaged to be married, Eugene Moore, David H. Thompson, Justus D. Barnes, Lila Chester, Victory Bateman, and numerous others, including the two child attractions: Marie Eline, the Thanhouser Kid, and Helen Badgley, the Thanhouser Kidlet. During the closing days of 1912, the New Rochelleans were busy at work on a two-reel film, The Dove in the Eagle's Nest, adapted from the novel by Charlotte M. Yonge. After the Middle Western Company left for Chicago the crew at home settled down to produce a string of films. On Friday night, January 3rd, Marie Eline and Helen Badgley were on stage at the Crescent Theatre in nearby Mount Vernon where their act included baby Helen's impersonation of a mechanical doll. So overwhelming was the applause that the manager asked them to come back the following week. Such theatre appearances were very profitable for the Thanhouser players, for a handsome extra payment was made, depending upon the number of patrons attending. Within a week or so, Harry Benham, Mignon Anderson, and possibly a few other players from the Middle Western Company returned to New Rochelle where they began work on Sherlock Holmes Solves the Mystery of the Four.